Numerous university studies have shown TriCure AD to be effective in both the prevention and treatment of Localized Dry Spots. Its unique properties allow for effective control while maintaining firm play surfaces on the widest variety of soil types and playing conditions. Other surfactants treat only the sand/soil component of a root zone leaving the organic matter (thatch, peat, and decomposing plant tissue) to become hydrophobic when moisture levels drop too low. TriCure AD is formulated to include chemical components which not only attach to sand and soil particles but also to various forms of organic matter found in turf soil profiles. These components enable TriCure to effectively treat all soils regardless of their textural analysis. Research done at the University of Georgia in 2008 showed a 50% improvement in irrigation efficiency on plots treated with TriCure AD. Additional studies showed the use of TriCure AD significantly improved leaching of salts from soil profiles while increasing the soil’s infiltration rate. TriCure AD can be used as a preventative or as a treatment for any hydrophobic condition, as well as an injectable product as a cost-effective replacement for irrigation surfactants. Most companies require the purchase of multiple wetting agent products for various soil depths and varying soil conditions, as well as some for prevention and some as curatives. Research in 2005 at the University of Georgia showed that the upper two inches of the TriCure AD-treated non-water-repellent soil dried more rapidly than the untreated, non-water-repellent soil. This effect enables soils treated with TriCure AD to dry down more quickly than untreated soil while maintaining optimum moisture for plant health. Recent studies conducted by Penn State confirm TriCure AD can successfully be tank mixed with fairy ring control fungicides to improve efficacy and is superior to other leading surfactants in combination with these fungicides. 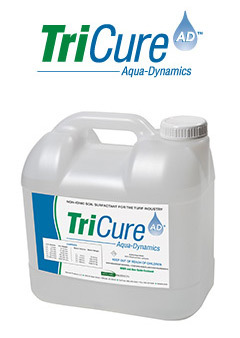 TriCure AD can be used by direct injection into irrigation systems, providing both superior control and significantly lesser cost as an alternative to irrigation surfactants with low active ingredient concentrations. Research comparing the leading surfactants showed TriCure AD to be stronger on an ounce per ounce basis than any of the leading competitive products. TriCure AD was shown to hold its strength when rates were reduced, allowing for great rate flexibility, cost savings, as well as greater efficacy toward the end of a spray cycle as product gradually diminishes. Other products tested showed rapid decline in efficacy when rates were dropped below label rates. Because TriCure AD doesn’t lose its strength at lower rates, it has the most flexible usage rates of any leading soil surfactant. Additionally, because TriCure AD doesn’t depend on standard HW chemistries to treat upper soil surfaces, it can be safely applied at higher rates to achieve seasonal control without the risk of holding too much water at the surface – as is the case with most HW – or the risk of phytotoxicity that is common with many “seasonal” products. TriCure AD does not contain any of the commonly used active ingredients that are associated with burning or phytotoxicity, and can be applied in the morning and safely watered-in in the evening without risk of burning. TriCure Granular is easy to spread on bunker edges or slopes, and contains the same chemistry as in liquid TriCure AD. TriCure Granular utilizes DG-Lite dispersible granular as a carrier and is an effective way to quickly release the chemistry with no residual left after normal irrigation. Why are wetting agents often ineffective in treating localized dry spots? Most wetting agents will work under normal conditions, but many are ineffective on soils under severe drought stress. Surfactants are typically designed to treat soil, but are not efficient in treating organic material. When not effectively treated, soil organic matter such as thatch and peat often remains hydrophobic, causing uneven water movement and LDS. TriCure AD addresses the cause of LDS by treating both thatch and soil. Are wetting agents designed to help soils retain water or to drain excess water? Wetting agents are designed to reduce the surface tension of water and help water move evenly through soil profiles. Not all wetting agents act effectively to help drainage. In fact, use of some surfactants can result in too much moisture being held in the soil. The chemistry in TriCure AD supports optimal conditions for both water retention and drainage. Why does the use of soil surfactants occasionally cause excessive water retention in turf root zones? Surfactants with simple, long chain molecules can create a webbing effect after multiple applications or at high application rates. This entanglement can restrict water flow causing excessive water retention on soil surfaces. Often, however, excessive moisture retention is caused by poor subsurface drainage and soil characteristics. TriCure AD is formulated to optimize moisture content by engineering water movement vertically and horizontally. Why do some wetting agents discolor and burn grass? High rates of nonylphenols, alkylphenols, and alcohols contained in many surfactants can cause cell damage. Some surfactants dissolve cuticle/wax layers on the leaf blades causing discoloration and burning if allowed to stay on the leaf surface too long. TriCure AD contains no harmful chemicals that can cause turf burn. Should wetting agents be applied at higher rates with fewer applications or more frequently at lower rates? More frequent application allows for more balanced water retention in the soil. Using higher rates to achieve seasonal control can reduce spraying frequency, but longevity is not always predictable due to soil type and climatic conditions. Also, the higher rates associated with seasonal applications can increase the risk of burning with some surfactants. TriCure AD can be applied weekly, monthly or seasonally without the risk of burning. Is it better to inject or to spray soil wetting agents? Injecting allows for shorter reapplication intervals and more efficient mixing, which increases effectiveness. This can lead to lower use rates by providing better dispersion into the soil than when wetting agents are sprayed. Injecting a 100% concentrated product is most cost effective as it avoids the need for pre-mixed irrigation surfactants (containing typically 75-85% water). Injecting TriCure AD (100% active) takes advantage of copious dilution and short reapplication intervals. Can I tank mix pesticides and/or fertilizers with wetting agents to allow easier application? Variations in product chemistries used with any surfactant can cause problems when mixed in combinations with other chemicals, making it impossible to guarantee compatibility. Field-testing should be done before tank mixing two or more chemicals not specifically designed to work together. Why are usage rates so varied between soil wetting agents? The variation in rates and spray intervals differs based on the limitations of the chemistries. Usage rates are tied to a product’s ability to perform over its normal rate of degradation. Some products are significantly stronger than others and more stable and effective as product is degrading, even to very low in-soil levels. TriCure has the lowest usage rate of any of the leading wetting agents, and slowly degrades, giving maximum flexibility with spray schedules. Can wetting agents be tank mixed with fairy ring control fungicides to improve efficacy? Numerous university studies have confirmed that tank mixing fairy ring control fungicides with wetting agents that hold moisture in the soil profile (as opposed to those designed specifically to flush water out of the soil profile) increases fungicide efficacy.